That configuration with 12 launch tubes is monstrous...can we expect it rolling out in numbers or is it merely a demonstrator? That is the loader launcher version or TELL. It has no attack ability on it's own but it's missiles can be launched as long as there is a TELAR (the 6 tube version which also has the tracking control radar) to control them. A normal battery has 2 TELAR's and 1 TELL. Three batteries with a TAR and C3 vehicle make up a battalion. Scheduled to deploy a brigade this year which normally is 3 battalions. So a normal battery has 24 missiles ready to launch? Something like 6 per TELAR (x2), and 12 per TELL (x1), giving us 24? Correct. A battalion can attack 36 targets at once with 2 missiles each. The BUK-3 system will be able to launch twice as many missiles, at a 50% further distance with a higher kill ratio then the BUK-2M system just now being delivered. In that top picture you can see the 6 tube and 12 tube model in the same field of view. Based on the angles and perspective I would say the 12 tube launcher is actually a S-350 TEL with a much slimmer missile. Vityaz TEL looks very different with his 12 missiles...not allowed to post links for now but check for yourself. Almaz managed to double the number of missiles for the slave launchers...or even triple if you compare it with older Buk variants. Same with the new 9M338 misiles for Tor-M2. also that IR camera could have been doubled for passive ranging. i like a lot the red tubes!! That actually would depend on missile rather than system itself. System itself should be capable of using all missiles developed for BuK, as long as they are containered. I suspect both SARH and ARH (or hybrids with terminal ARH) will exist. First Division SAM "Buk-M3" has already entered service with the Russian army. The difference is a new modification dramatically increased the range of the set - up to 70 km and a height of hitting the target - up to 35 km. "Buk-M3" is equipped with a new anti-aircraft missile 9M317M capable of acting on a "fire and forget." In this case the missile is now in the transport and launch container and start vertically (as C-300), instead of the target dovorachivat as old model "Bukov". With the new range of radar can simultaneously track and direct missiles at 36 targets. Still depending on the system because the their guidance methods are different each other. The Sarh missiles use mid-course radio-commmand while Arh missiles use mid-course data-link updated. The guidance difference makes Arh missiles can launch vertically instead. I am fairly certain now that BUK-M3 has Active Radar Homing for terminal guidance and the missile is not the same as Shtil-1 VLS which is 9M317M but a new missile or a deeply modernised variant of 9M317M. 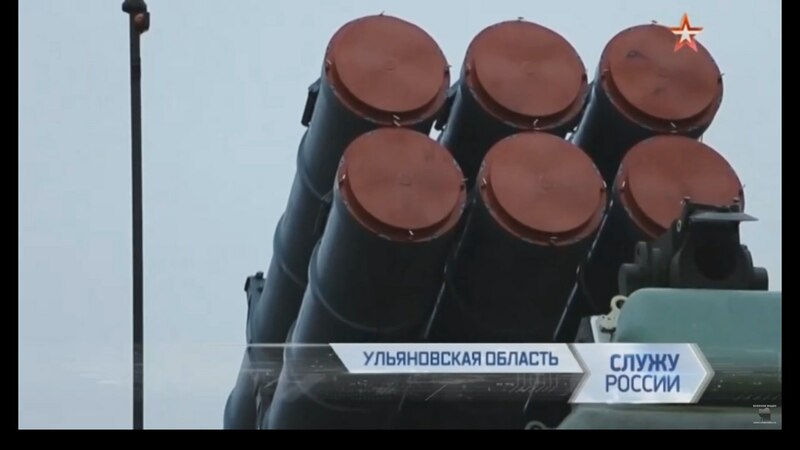 specs being displayed for Naval Shtil-1 system in VLS mode and BUK-M3 , these specs are drastically different infact to the extent the BUK-M3 would hardly be called a continuation of BUK if there was no mention of it. There is some smoke/mirror screen being played out. Think how can the same missile for BUK-M3 will show drastically different characteristics for VLS Naval SAM ? Do these interceptor looks identical by any yard stick ? As to why not 36 target , SARH guides the target till interception and hence there is a limitation on how many it can track and guide you can clearly see the limitation to max 12-16 wrt to Shtil-1 , also you need multiple engagement radar , I read total 8 Orek to track/guide 16 Shtil-1 missile. When it comes to BUK-M3 it can track guide 36 missile because ARH allows you the independence in terminal homing leaving the radar to provide MCG to large number of targets in air for the missile till such time Terminal Homing takes over it get completely independent unlike SARH guidance hence they can track/guide 36 missile , Also they mentioned a kill probability of 0.999 for BUK-M3 system ,The Track/Guide and Kill probability is a clear indication BUK-M3 has some form of terminal guidance. Hence they claim that VLS Shtil-1 and BUK-M3 uses identical missile is as good as stating Mig-29 and Mig-23 are identical aircraft. No reason at all for system not to support both actually. Militarov wrote: No reason at all for system not to support both actually. Yes but currently the mid-course data-link updated guidance is not available on Buk-M2 so they need to be upgraded both avionics and launchers for new Arh missiles. Does anyone possess further information on the The tele-thermal imaging target designator that has replaced the optical trackers? Creating a missile 9M317 family was held in accordance with the trend of global missile in terms of anti-aircraft guided medium-range missiles. For a number of parameters 9M317 missile has the best value among similar products. For the first time in its practical shooting was confirmed by the high efficiency of the defeat anti-ship missiles flying at super small (up to 5 m) altitude. Open architecture means external information support, ease and simplicity requirements to allow the launcher to use them more than a dozen different versions of air defense systems of the Ground Forces and the Navy of Russia and some foreign countries. Tactical and technical characteristics of the missiles to ensure its effective use in the fight against air attack weapons: the aircraft of all classes of helicopters, including hover, cruise missiles for various purposes, the elements of high-precision weapons. Due to the flexibility of the technical solutions embodied in the onboard equipment missiles and combat means SAM, the first time for complexes with semi-active radar homing able to provide an effective fire on the radio-and surface targets. Another result of the unification and universality of the rocket was to create on its basis missiles with active radar homing head, ensuring the implementation of the principle of "shot - forgot." This modification SAM 9M317 missile family has come full cycle of working out as part of one of the complexes, applying SAM 9M317. If necessary, after a short OCD, the missile can be adapted to other complexes, using family 9M317 missiles. Universal missiles 9M317 allow the customer to set up inter-service fleet of missiles in the interest of the supply ship missiles type SAM "Calm" and military-type SAM "Buk". Interspecific missiles park will allow the customer to arrange its effective application, depending on the conditions prevailing at a particular theater, to realize the maneuver means and forces to increase the stability of the rocket and the technical support of the Armed Forces. This makes it possible to significantly save material resources for maintenance. PJSC "SPDE" extensive use of the concept of integrated software family 9M317 missile operation, involves the provision of a full range of customer services. At the heart of this system - services, providing assistance in the delivery of programs rockets management programs supply to operate, service to provide test equipment, materials, solution engineering and industrial issues, assistance in contract work and the implementation of welfare programs, the required level of quality of our products. Although if one compares the capability of Shtil-1 and BUK-3 they are too drastic that BUK-M3 would get classfied as new missile system ... even if you say increase the diameter of Shtil-1 missile by few cm and use new kind of energetic propulsion to get higher range , top & average speed and some modified control then one cant really notice it by mere looking at photographic comparision. At 35 km altitude of interception BUK-M3 would likely be getting new control system based on TVC , may be the gas dynamic based TVC used on 9M96 missile , at those altitude conventional control surface are pretty useless and 9M96 seems to have even smaller control surface then BUK-2 missile. Another clear indication is the number of track/attack and 0,999 claimed capability its possible to get such high probability by some kind of terminal homing be it ARH or IIR certainly for SARH its not possible. Never mind this cleared even my doubts , The picture in the link of BUK-M2 attacking ground targets and even ship target based on pure ballistic profile , Clearly gives credence to Russian claim that the GroundBased SM-3 based system in Europe can act as BM with simple change of software and can attack Russian ground targets with known co-ordinate out to range of 1200 plus km in pure ballisctic profile clearly violating INF treaty. If BUK-M2 can do it a more sophisticated system with far better target discrimination can easily take out pin point ground target , What they would need it a small warhead of 100 kg or worse sub-kiloton Nuclear weapon which can easily package under 50 kg ! Austin wrote: Although if one compares the capability of Shtil-1 and BUK-3 they are too drastic that BUK-M3 would get classfied as new missile system ... even if you say increase the diameter of Shtil-1 missile by few cm and use new kind of energetic propulsion to get higher range , top & average speed and some modified control then one cant really notice it by mere looking at photographic comparision. Not just that, the Aegis-Ashore MK-41 system is capable of launching cruise missiles, it's even advertised in their brochures and promotional video, which is pure blatant disregard/violation of the INF-Treaty by Uncle Sham! You just know it when Uncle Scumbag starts bitching about Russian "violations" he is doing the gross violating himself. treaties then so be it. Uncle Scumbag needs instant justice for any attempt at nuclear aggression against Russia. Indeed INF treaty and START has now become relic of past , None of these treaties when signed has to worry about US global deployment that US is currently doing both in Land and Sea , All these simply dilute relevance of INF/START treaty and works to advantage of US in keeping these treaties. kvs wrote: You just know it when Uncle Scumbag starts bitching about Russian "violations" he is doing the gross violating himself. Russia does not want to get confrontational with EU and thats the approach US is using to push its agenda. Otherwise Russia would exit INF treaty a long time ago by my opinion. Maybe the proper response would be not to publicly leave the INF treaty, but to publicly leave the MTCR treaty, say for example develop a joint venture and TOT with Cuba on long distance "recon" UAV's. The rest of the BUK M3 brigade has apparently arrived and will soon go on combat duty. Still not clear of unit or location but the writer believes it will go to the new (90th) brigade being formed somewhere in the Rostov region.